Wanderers: An Astrobiological Exploration - The Interplanetary Clothing of the Future. 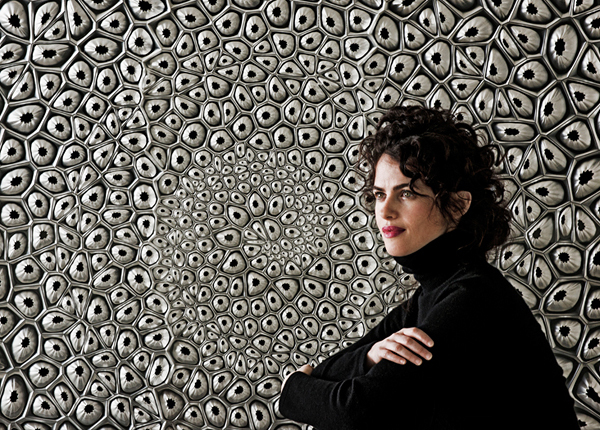 Neri Oxman, a prominent, intriguing Israeli architect and designer at MIT has devised wearable 3D-Printed structures for voyages into interplanetary space. Best known for her work within environmental design and coining the term 'Materialecology' Oxman continues to innovate and inspire within the realm of digital and fabrication design. Oxman (pictured above) and her team at MIT have designed 'wearable skins' that have the potential to facilitate synthetic biological processes, that may one day allow humans to survive on different planets in our solar system. Each 3D Skin is composed of a distinctive material and density, specific to the conditions of each individual planets. The four pieces (shown below) are also imagined to be embedded with living matter. The skin shown in the top left corner, for example, is called Mushtari. The structure is designed to interact with the atmosphere of Jupiter. The piece situated around the abdominal region is proposed to consume and digest biomass, absorb nutrients and generate energy. 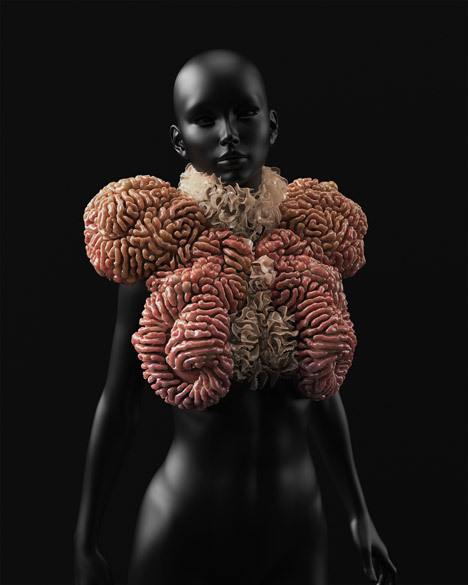 The wearable structures are designed to house biological material that adapts to each planets environment. The design fabrication of the 3D-Printed garments includes that of pockets and inserts, as well as incorporating computational 'growth patterns' into the overall shape and structure of the skins themselves. The exploration into this particular area of synthetic biological design is, quite arguably, one of the most important; Oxman, continue to inspire.